The holidays are coming up and I have to empty out my fridge before I head back to DC for 12 days. Why, oh why, did I get groceries last weekend? 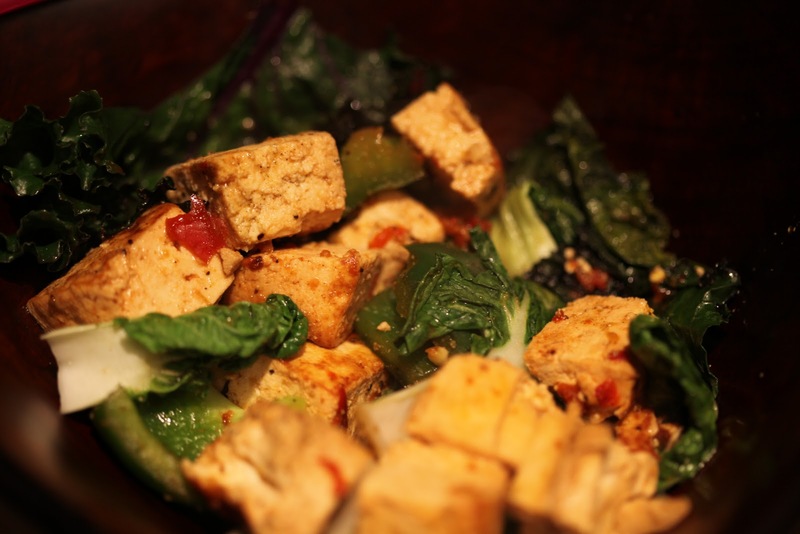 I was thinking today about what I might do to use up some of the remaining produce including kale and baby bok choy, and I decided as well that I need to cook up the tofu I bought. It has been years since I have cooked tofu. In fact, this is the second time I’ve bought it in the past three months, and the last package expired before I was ready to cook it. I was determined to finally try it out tonight. 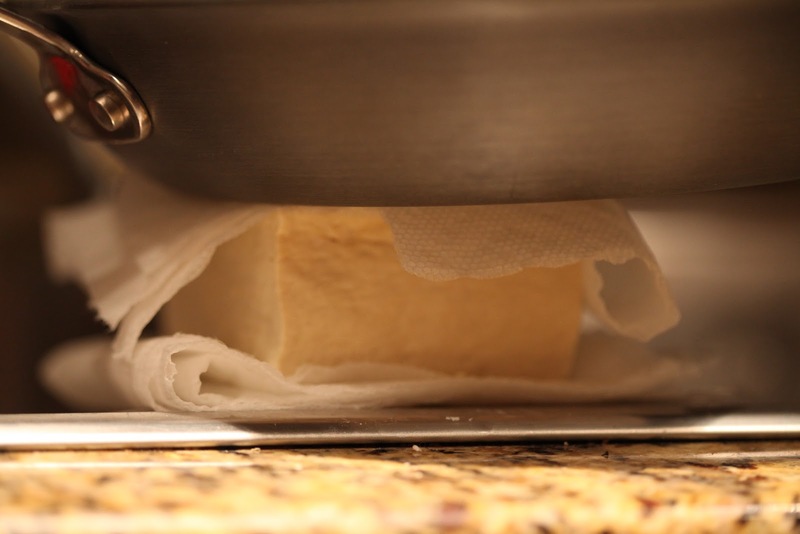 First step, press medium or firm tofu between thickly folded paper towels with something heavy on top. I opted for a frying pan. Press for about ten minutes and actively squeeze down a bit to drain the excess water. Steam for 10 minutes, and then lower the heat or set aside. 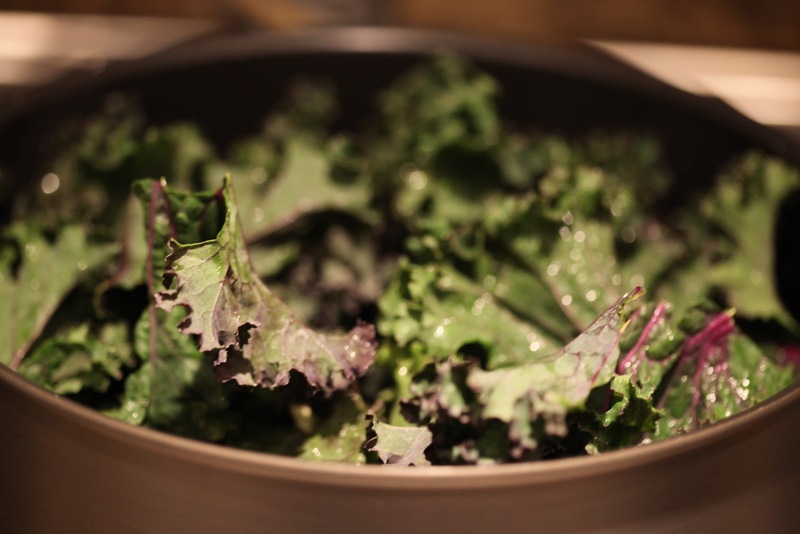 Make sure the kale is well cooked through as it will be a stark contrast to the tofu otherwise. Once dried out sufficiently, cut into cubes and add to a frying pan. Top with all the ingredients above except for ginger. (Although, you could add the ginger — I just put a lot in the vegetables already.) 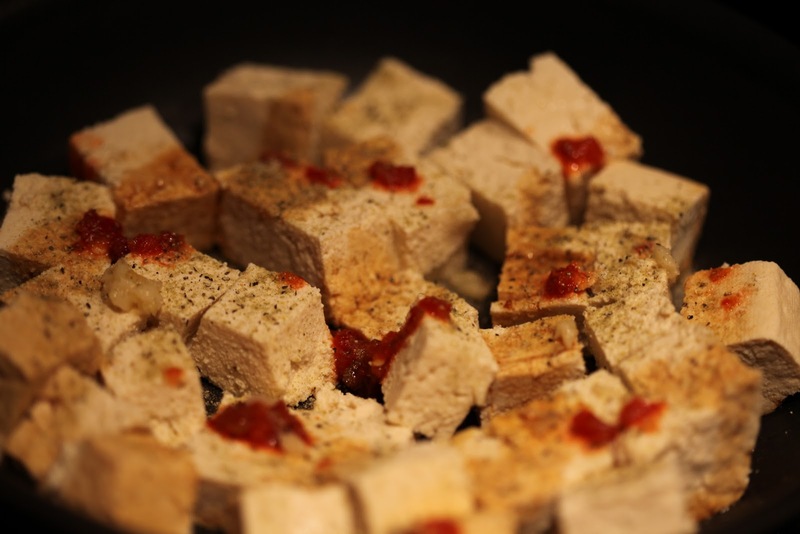 As the tofu is cooking, turn the cubes and press them gently to help brown the edges a bit. 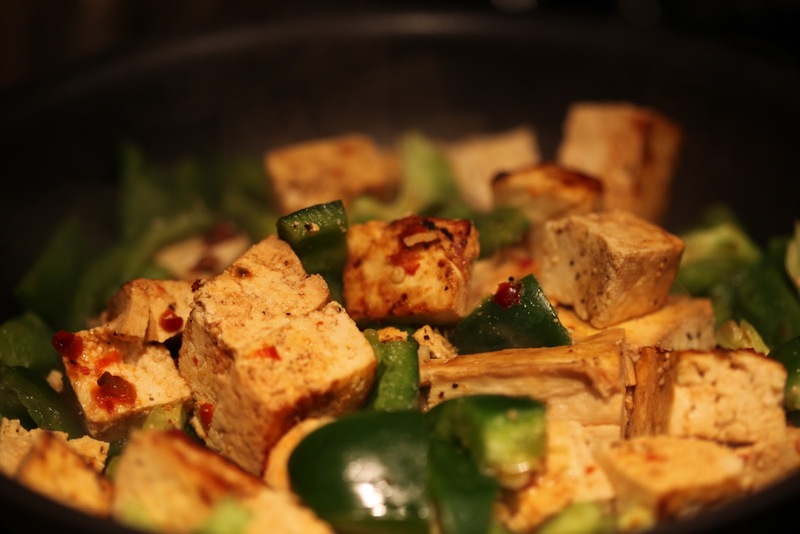 Once the tofu has softened up, add some chopped green bell peppers. Stir for a few more minutes until cooked through, and add to the greens. I can tell you it’s not my favorite meal, but it was good. I might try to make it again with different vegetables. 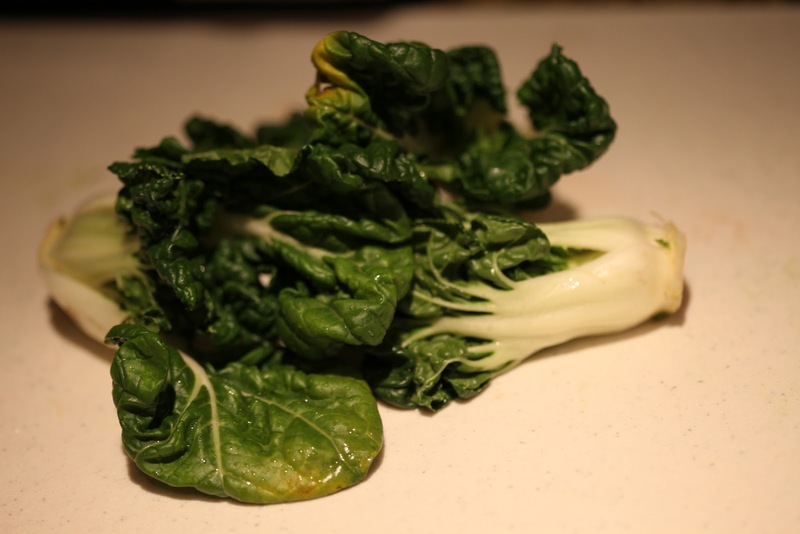 The kale is a strong and bitter flavor, and it just didn’t feel like the right ingredient. Still, it was healthy, fast, and filling. Plus I got to use up some fridge items before my trip, so that’s always a bonus. When I heated up leftovers the next day to make a spicy tofu wrap, I nixed the kale and wilted some romaine lettuce instead. That complemented the tofu much better, and was much easier to eat within the wrap as well. Total cook time, 10 min and 5 min prep. Calories, approx 250 per serving.